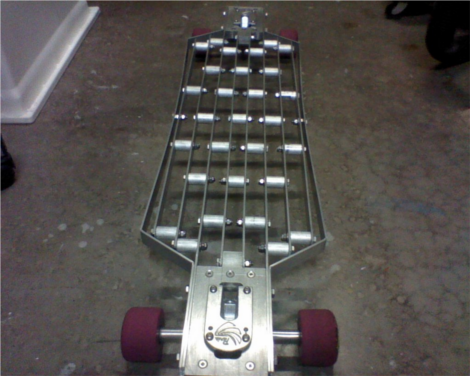 Reddit user [davvik] made an album to show off his custom all aluminum longboard. The whole setup weighs about 12lbs, which is not exactly light for a board. In spite of the added weight [davvik] comments that it is actually pretty responsive. The design is not uncommon but seems to have opted out of the speed holes in favor of structural rigidity, and frankly we love it. We might not risk wearing sandals on the thing, but [davvik] says for the most part the whole setup has the feel of a wooden longboard, and the added weight makes it fun downhill. Future plans for the board include machining out the ends, we think this would be a great opportunity for some DIY anodizing! Well you guys are on CRACK!!! It breaks down.. a bit. was gonna post to reddit. check source: reddit. oh. I’ll bet a fair bit of the weight is in all those fasteners. Speed holes don’t necessarily sacrifice strength. The trick is to use a dimple die to stamp in a lip around them. Holy crap, I am drooling all over that gallery. I never considered making a metal longboard. Sweeeeet. When I read lognboard I thought of surfing and how cool it would be to make a metal surfboard float. I have one designed similar to this. I have a huge issue with side flex. If you try to carve too hard the board will rather flex than turn. However I really like the outer metal band to sort of “cover” the perimeter of bolts from the rest of the board. A very nice touch.